Did you catch the YouTube video making the rounds this week of a moose that decided to take a dip in someone's backyard swimming pool? 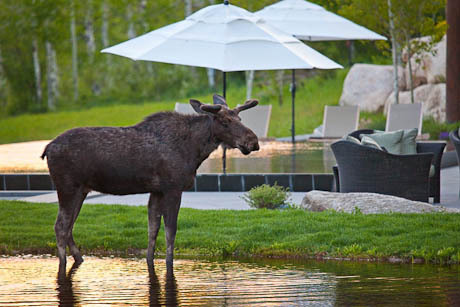 It reminded me of my own moose & swimming pool encounter. I was finishing up an architectural photoshoot of a luxury home in Steamboat Springs, CO a couple years ago. I had picked out a nice spot for an exterior dusk shot and was waiting for the light to get just right. I looked down for a few moments to adjust some camera settings and when I looked back up there was this big bull moose drinking from the swimming pool. After getting over the initial shock of seeing what I was seeing, I started clicking off frames. The noise of the shutter attracted his attention and he lifted his head and looked right at me. A moose may be nothing more than an overgrown deer but up close they are plenty intimidating. Thankfully he decided I was harmless and continued about his business. According to the homeowner, moose are pretty regular visitors. He thinks they are attracted to the saltwater in the pool. Spotting a moose anywhere in Colorado isn't all that uncommon these days, but at one time moose were hunted to virtual extinction throughout the state. Today's thriving population is a result of a reintroduction program begun in the late 1970's. Welcome back, boys.